or The Pie Which Almost Wasn't Made. We're having a pig of a week around here. N is home with the flu all week on doctor's orders (could be swine flu, hence the pig remark. Yeah I didn't think it was funny either but my fever made me type it!). I of course got sick as well almost immediately. What made it all really fun was the heatwave we're having in Brisbane at the moment. I hate the heat at the best of times but to be suffering through 35 degree days, in winter, with a high fever and a grizzly baby as well? Not fun. Nonetheless, I am a baker. So I soldiered on and baked. But I did make a few minor stuffups from not reading packets or the recipe properly. I decided to go with a crumb crust for this pie and used my standard recipe which is a 250g packet of sweet biscuits with 125g melted butter. I chose rice cookies for the base this time as they are made without wheat but didn't realise the packets are only 200g not 250. No wonder it was swimming with butter! I chucked in some cornflakes to soak up the excess and carried on. I kinda forgot what I was making and pressed the crust only over the base of my springform pan not up the sides as well. That came back to bite me later as the filling started to ooze when I unmolded it. So I stuck the whole thing in the freezer for a couple of hours and that worked like a charm. 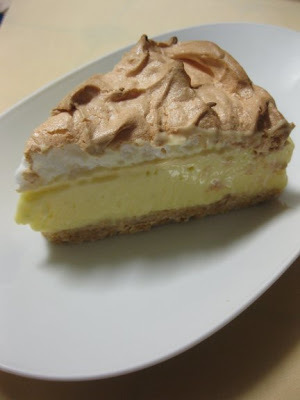 Our griller is separate from the oven and is no where deep enough to put a pie like this under to brown the meringue. So I drew an 8" template using the base of a baking pan and made a disc of meringue. I baked it at 180 degrees C for15 minutes until it was nicely browned and then plopped it on top of the filling. Done! I only got one semi decent photo because it was quite late by this stage and still about 30 degrees and my pie was starting to soften like icecream and get the wobbles. AWESOME. I had my doubts but this really was the creamiest meringue pie ever. Often the fillings for these are gelatinous and a bit sweet. This was smooth and creamy and zingy from the lime and ginger. I would love to switch it up next time and use the cream filling as a topping for pavlova with lots of whipped cream and fruit. Delightful. This week's recipe was chosen by Linda of Tender Crumb. You can get the recipe on her blog! Nice improvisation to save the recipe - applause!!! I'm so glad that you enjoyed the pie - it was a total hit at my house.